When I'm going through the Fictionmags Index and other places on-line, looking for scans to use in these posts, I often see a cover and think, "I have to write a story with that scene in it!" So far I haven't gotten around to doing it, but I will, and I'm going to start with this familiar trio, although I'll have to decide whether to make the girl a blonde or a redhead. Lots of deep thought goes into being a writer, let me tell you. But to the issue at hand . 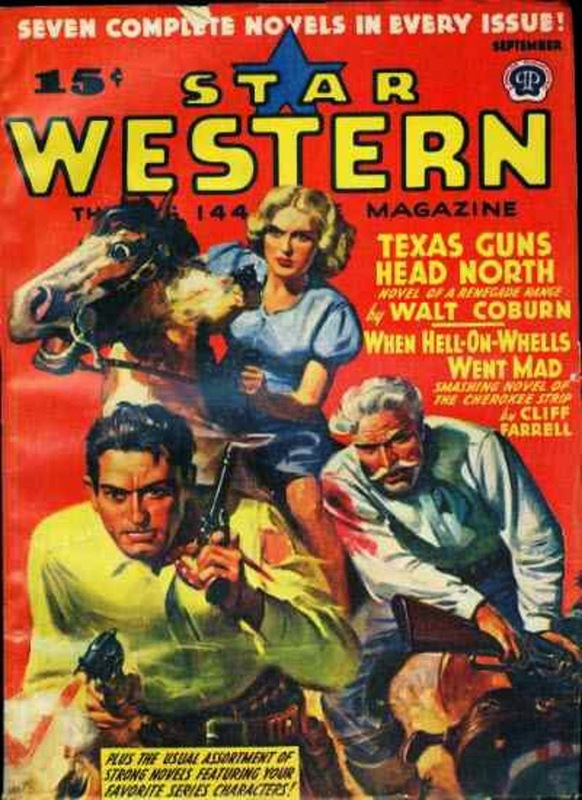 . . a good cover (I don't know who painted it) and the usual sterling line-up of authors from STAR WESTERN: Walt Coburn, Harry F. Olmsted, L.L. Foreman, Cliff Farrell, Arthur Lawson, Stone Cody, and Robert E. Mahaffey. That's a great bunch of pulpsters. I'm glad I'm not the only one who does that. I have a pulp fiction wall calendar and create stories out of the cover art. Last month was Black Mask. May is Marvel Science.